Sixpence For Your Shoe: Stream me up, Scotty! Due to conflicting comittments, age and travel requirements, it is unlikely that absolutely everyone on your guest list will be able to attend your wedding in person. This can be particularly devastating, especially if is a close relative. After all, guests are invited for a reason! When one of our clients faced this exact situation, we were determined to find a way for those not attending to still be part of the ceremony. 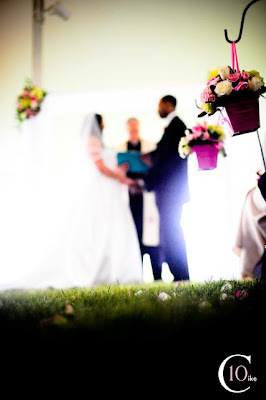 Enter "I Do" Stream, of Tolland, Connecticut, a vendor offering event streaming for any occasion. They supply a streaming service to any veiwer in the world so that guests who cannot be at your wedding can re-live the special moments real time. "I Do" Stream creates a chat room, wedding guest book and will evite friends and family to watch the live broadcast. The video is also on On Demand for the next 30 days, superb for those that would like to see the event post, including the bride and groom! This service is surprisingly affordable, with packages starting at $349. You have the option to use your own equipment and do the filming yourself, have them provide the equipment and you doing the filming, or them doing it all from soup to nuts. All packages include live technical support on your wedding day. No wireless internet at your church or venue? No problem! All you need is Verizon's Mobile Broadband card, or one like it. Interested? Call (860) 684-5414 and ask for Phil.